There are many versions of New York City Street Maps and Subway Maps. Free, paid and online interactive. It generally takes a combination of all of these maps to navigate NYC, but here are a few shortcuts. 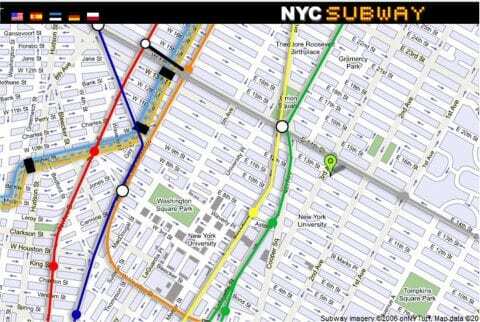 Combined New York City Street and Subway Maps are usually the most difficult to find – most maps have one or the other. That is why we created our very own NYC Printable Guide, covering every neighborhood, attraction and route in detail. A New York City Street Map is only a map – it doesn’t tell you how to get around the city. Unlike most driving cities that use a map program or GPS, in New York City, we use CityMapper, Google Maps or another Subway Planning Guide, designed for public transportation in major cities. See the NYC Subway Map page for Subway information and step-by-step instructions using CityMapper. Google maps also offers walking and biking directions. Pay attention to how you exit the Subway (not just the stop to get off the train), as it is important to know which exit to use out of the station. You should also map a reverse route, as sometimes the ways to go and return are not the same (kind of like one-way streets). One more tip – PLEASE, do not stop and pull out your New York City Street map at the very top of the subway stairs to try and figure out where you are…millions of people are standing behind you with places to go. How would you feel if 1 million people were blocking your driveway while you were trying to get work? Please step to a less crowded area so they can get out of the subway. The NYC Printable Map Guide Book Package is perfect if you want to buy all of this with one click: NYC Street Maps, NYC Subway Maps, NYC Tourist Guide and much more. This is my favorite NYC Street Map. I give this map to every friend who visits me – and I carry a bunch around to give to visitors whom I meet. The company, Anton Miles, also has a Subway Map of New York. There are a variety of these maps, including bus, subway and street, but I carry the Lower Manhattan Map everywhere with me. Don’t be fooled, not even most taxi drivers know every street in Lower Manhattan – since NYC was built from the Southern Tip (Statue of Liberty and Financial District) going North, urban planning did not have it’s effect until roughly the Union Square area (14th Street and up). You may also purchase these New York City Street maps at the New York Transit Museum in Grand Central Station for about $1.00 each.